Osteomalacia is softening of the bones. 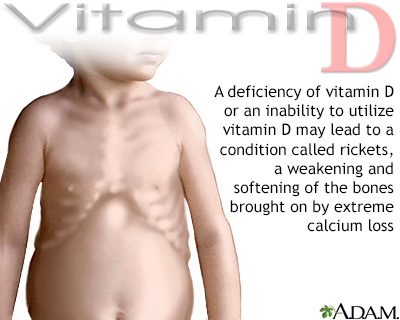 It most often occurs because of a problem with vitamin D, which helps your body absorb calcium. Your body needs calcium to maintain the strength and hardness of your bones. In children, the condition is called rickets. A lack of the proper amount of calcium leads to weak and soft bones. Spasms are contractions of the muscles of the hands, thumbs, feet, or toes. Spasms are usually brief, but they can be severe and painful. Blood tests will be done to check vitamin D, creatinine, calcium, phosphate, electrolytes, alkaline phosphatase, and parathyroid hormone levels. Bone x-rays and a bone density test can help detect pseudofractures, bone loss, and bone softening. More importantly, osteomalacia can look like weakening of the bones from osteoporosis on bone density testing. In some cases, a bone biopsy will be done to see if bone softening is present. A bone lesion biopsy is the removal of a piece of bone or bone marrow for examination. Treatment may involve vitamin D, calcium, and phosphorus supplements taken by mouth. People who cannot absorb nutrients well through the intestines may need larger doses of vitamin D and calcium. This includes people who have some types of weight loss surgery. People with certain conditions may need regular blood tests to monitor blood levels of phosphorus and calcium. Some people with vitamin deficiency disorders will get better within a few weeks. With treatment, healing should happen within 6 months. Call your health care provider if you have symptoms of osteomalacia, or if you think that you may be at risk for this disorder. Eating a diet rich in vitamin D and calcium and getting sufficient exposure to sunlight can help prevent osteomalacia due to a vitamin D deficiency. Demay MB, Krane SM. Disorders of mineralization. In: Jameson JL, De Groot LJ, de Kretser DM, et al, eds. Endocrinology: Adult and Pediatric. 7th ed. Philadelphia, PA: Elsevier Saunders; 2016:chap 71. Weinstein RS. Osteomalacia and rickets. In: Goldman L, Schafer AI, eds. Goldman-Cecil Medicine. 25th ed. Philadelphia, PA: Elsevier Saunders; 2016:chap 244.